Location, location, location! Our Historic Registered 1920 stucco double is located just steps from the shopping and dining of Old Town's Main Street. Relax in our 'SOUTHERN COMFORT' apartment among comfortable antique furnishings, beautiful hardwood floors, beaded board walls and ceilings for an atmosphere that feels like home for your vacation choice for a few days, a week or more! Enjoy the outdoors on the front porch or the rear deck! You may elect to sit out front and watch the world go by or take a walk to visit the variety of interesting shops, art galleries, restaurants, coffee houses and music venues, all within a few short blocks of our cottage! We are two blocks from the waterfront and less than one-half mile from the public beach and fishing pier as well as a walkway/bike path along the beach that goes on for miles! We are also within a few minutes drive of a world class golf course and casinos. If you're here on the evening of Second Saturday of each month, you can enjoy the extra hospitality of our merchants in Old Town with complimentary food and drink in the galleries and shops and live music along Main Street for your added enjoyment. Stay with us in our welcoming cottage for a great way to meet the locals of Bay St. Louis and experience 'A place apart.' We know you'll love our friendly people and the charm of our small town and find it hard to leave! It's location in Old Town makes it ideal as a vacation rental to allow our guests to be in the middle of what makes Bay St. Louis so special! Our location allows easy access to any activities along the Mississippi Gulf Coast! Tastefully decorated. Old time charm with hardwood floors & high ceilings. Porch & Deck for relaxing. Total environment is conducive to your comfort. 1.5, Towels & Washcloths provided. 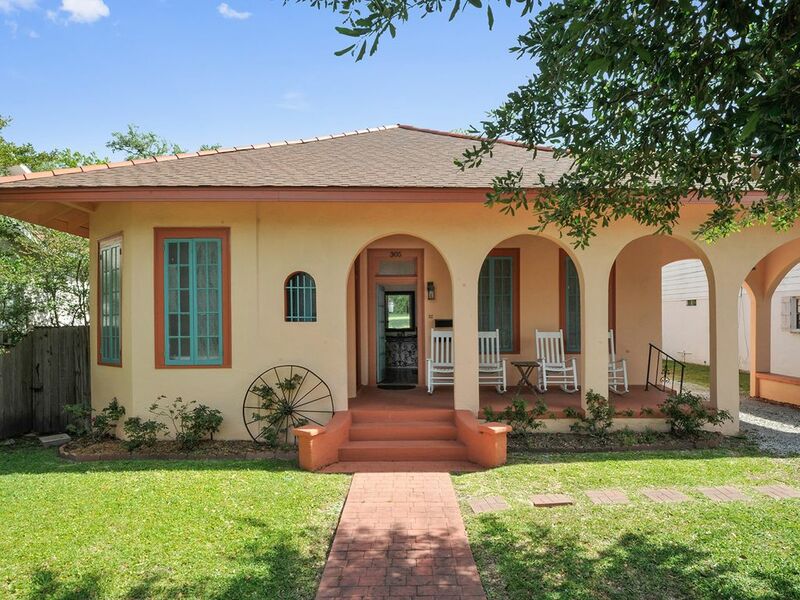 2 blocks from Beach Blvd in the middle of the historic district. Always love our stay here!!! Precious and spacious. Will definitely stay there again. Great location. Everything in walking distance. Really appreciated that the property manager was quick to attend to any issues. House was very clean and and in great walking distance to local shops and restaurants. Clean and close to downtown BSL. We really enjoyed our stay. The cottage was clean as should be expected. It's just a couple of blocks from the beach which was really nice. Plenty of local restaurants and shops within walking distance. I really liked that the owner took the time to create a nice binder full of information about the surrounding area and the property. The queen bed which I and my youngest daughter slept in was firm but comfortable. Although we didn't use the back deck it did look inviting and cozy. AC kept us cool as it was blazing hot and humid during our stay. As one reviewer noted the kitchen is lacking on large pots and pans. There are plenty of utensils and cups, a couple small pots and pans but nothing for like a crab boil or big dinner. This was not an issue for us though, nor is it a complaint, as we had no intentions of cooking on our getaway. After all, we came for the great seafood! I only point it out so that potential tenants know what to expect. The trash can could use an upgrade. It was the size of a trash bin found next to an office desk. That's the only con but not a deal breaker. We always come to the area at least once a year and I would definitely consider coming back to stay at Southern comfort cottage. Thanks for sharing your lovely property! A unique and lovingly restored home. This home just made us have 'Mint Julips' on the veranda. Very well outfitted for your every need. Great location. Close to our favorite resturant in Bay St.Louis. Trapanies Eatery. You must try the fried green tomatoes with crab and hollandaise. Even had a roaring thunderstorm the night we arrived. Would definetly stay there again. We are centrally located and provide easy access to activities along the Mississippi Gulf Coast. Come live like a local! $59.00 Non Refundable Accidental Damage Protection provides you with up to $2,000.00 property damage protection, tenant accepts responsibility for damages over $2,000.00.